March 29, 2011: Revolutionary fervor from the Middle Eastern revolutions and Pakistan’s 2009 lawyer’s movement appears to be having a snowball effect. Young doctors in the largest province of the country have called a long drawn strike calling for better remuneration. An increasing number of young doctors, groups and associations are galvanizing support for the Young Doctors Association, the apex body which lent impetus to this movement. Their cause is becoming a rallying cry for drawing attention to a number of systemic constraints in relation to human resource issues as they impact young doctors. Our recent opinion explores the broader policy context. 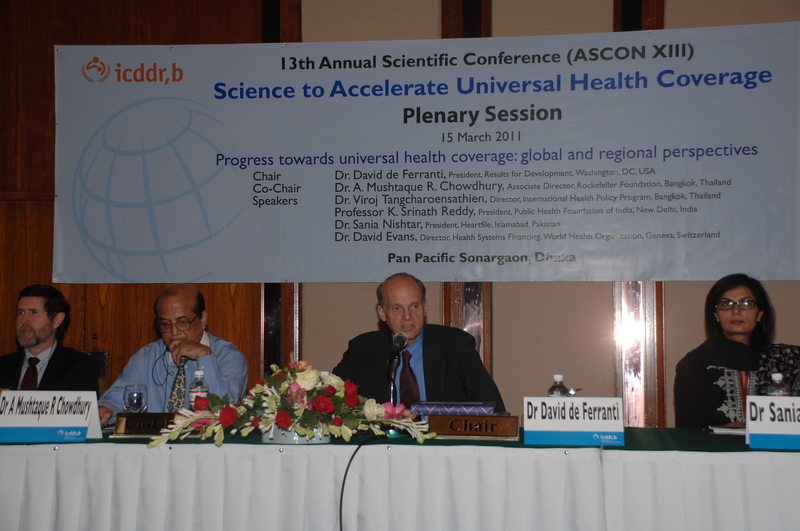 March 24, 2011: We are pleased to be sharing with you our recent piece in the Lancet on the “Challenges of Scaling-up”, which can now be downloaded. Young doctors in the largest province of the country are on strike for the 17th day running. With revolutionary fervor from the lawyers’ movement and the Middle Eastern revolutions shaping our societal political culture, it seems that the movement is having a snowball effect. An increasing number of young doctors, groups and associations are galvanizing support for the Young Doctors Association, the apex body, which lent impetus to this movement. Their cause is becoming a rallying cry for drawing attention to a number of systemic constraints in relation to human resource issues as they impact young doctors. Their demands are legitimate—pay raise, pay protection, increase in health budget, and implementation of a service structure and regularization of doctors on contract. However, the determinants of the problem and possible policy approaches are complex and multi-dimensional. This comment aims to highlight some of the policy insights and imperatives which interplay in this complex space. First, these demands have arisen in a fiscal year where there has been a massive development budgetary squeeze, after the floods of 2010. This is also a year where there is an elephant in the room—the 18th Amendment has altered the health sector’s institutional landscape and several administrative and human resource related parameters are in a flux. As implementation of devolution gets underway, management of human resource service structures will be problematic and will need careful management. Secondly, inadequate remuneration of doctors is part of an overarching problem—low investments in social service delivery in general and health in particular. Chronic under-funding of the state’s health infrastructure is the major fault line. As a result, providers in the public system are seldom remunerated according to prevailing market trends. This creates problems at several levels. On the one hand, as a result of better incentives in the private system, doctors are driven to private practice and establishing private enterprises. In urban settings where some level of oversight can be maintained, this results in dual job-holding, with doctors working both in the public as well as the private system. However in rural/remote areas where oversight cannot be maintained, absenteeism is rampant. Public doctors simply do not serve in the public system. Some are maintained on salary books only and exist as “ghost workers”. Chronic under-funding of the public system, coupled with an unregulated burgeoning role of the market in health and lack of transparency in overall health governance also create a number of other distortions in the health system, which I have alluded to in my book, Choked Pipes. There are options available to plan and institutionalize reform to overcome these distortions. Various entry points exist through which reform can be initiated—changes in human resource structures one of them and it is here that understanding the dynamics which shape the young doctors’ recent protests assumes importance. Human resource and health systems are deeply inter-woven. Human resource is not just another input into the health system, as are financial and physical resources. Individuals are strategic actors within the system who can act individually or collectively to facilitate the process of change by improving quality and efficiency. Conversely, they can also be the critical impediment to a reform process. For example, decentralization can grant appropriate prerogatives and/or take away decision-making powers that promote arbitrariness. Pakistan has experimented copiously with deploying and de-tracking from decentralization of the local government system, 2001 onwards. Its fall out is evident in many areas, but is most evident in the area of human resources for health, where a high degree of uncertainty shrouds workers’ performance. The premise behind the devolution initiative has almost been defeated. Another example is the area of “outsourcing” and “contracting out”, which can impact working conditions. New service delivery arrangements, public-private redeployment and new recruitment and retention mechanisms, can either be perceived as a threat or present a conducive environment for enhancing performance. An illustration of this is the Peoples/Presidents Primary HealthCare Initiative, where entrenched bureaucracies are the actual impediment to the process of scaling up reform. A similar situation applies to past experiences in granting public hospitals autonomy where staff incentive is the core driver determining outcomes. Changing public service status as a result of reform is another factor as it can have implications for workload in addition to incentives. Implementation of Khyber-Pakhtunkhwa’s hospital autonomy policy in 2002 is a case in point as it sparked strikes and demonstrations by paramedics, who feared losing their flexible public job status by being part of a more stringently governed private sector. The critical role of human resource in shaping the direction of envisaged change should, therefore, not be under-estimated—ongoing protests must be viewed in light of this understanding. Thirdly, this situation should draw the attention of policymakers to the lack of existence of a comprehensive policy on human resources for heath in the country. There are three issues in relation to the health service delivery workforce, which need attention—numerical inadequacies, issues related to distribution and deployment, and problems with capacity building and training. While the number of doctors in the country has increased since 1947, critical numerical inadequacies prevail. The doctor nurse ratio is 2.7:1 as opposed to the internationally recommended 1:4. There is critical shortfall of many other categories of health workers. This has been compounded by mal-distribution, ineffective deployment, and uneven distribution between the rural and urban areas. Many issues need to be addressed in the domain of under-graduate and postgraduate education, in-service training, and continuing education. Each of these has to be relevant to the needs of respective health professionals. There is the additional dimension of problems related to human resources for health administration particularly with reference to staffing key governance positions, training and capacity building and institutionalizing accountability. Over the years, political and external interference in decisions, particularly in relation to recruitment, transfers and disciplinary actions has become deeply ingrained. Erosion of mechanisms to compel accountability and politicization of governance are an impediment for efficiency and a demoralizing factor within the public sector. A human resource policy needs to be developed taking all these factors into consideration. The policy should be based on an objective assessment of needs and can benefit from being translated into a Health Services Law, which encompasses all categories of healthcare providers and lays down consensus-driven roles and prerogatives. Insights can also be drawn from the recommendations of the National Commission on Government Reforms, which have not been implemented. Despite our Pandora of problems, Pakistan’s societal political culture is getting stronger with increasing awareness amongst people about matters, which impact their rights and well being. Pakistan’s decision makers must accord careful attention to such movements in an overall environment charged with revolutionary fervor. 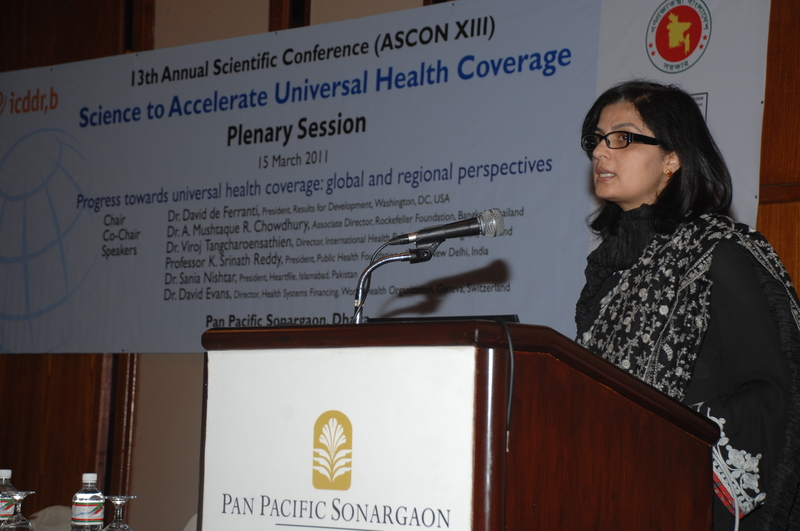 March 15, 2011: Sania Nishtar gave a presentation in the opening plenary on “Managing the public-private mix: remedied for the Mixed Health System Syndrome” during the 13th Annual Scientific Conference icddr,b, Dhaka, Bangladesh.